46 The PCB Design Magazine • September 2017 Plane pairs in multilayer PCBs are essen- tially unterminated transmission lines—just not the usual traces or cables we may be accus- tomed to. 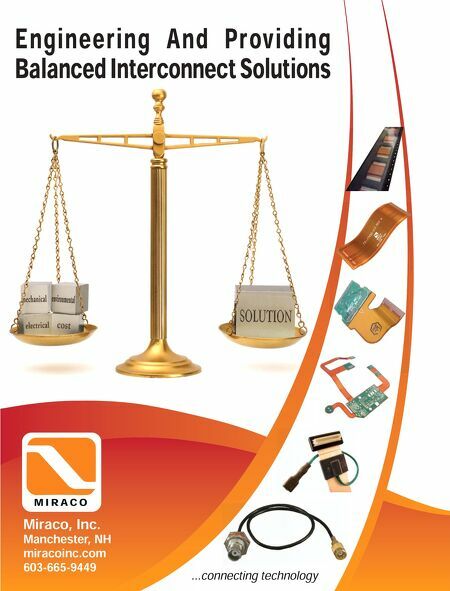 They also provide a very low-imped- ance path, which means that they can present logic devices with a stable reference voltage at high frequencies. But as with signal traces, if the transmission line is mismatched or unterminat- ed, there will be standing waves: ringing. The bigger the mismatch, the bigger the standing waves and the more the impedance will be lo- cation dependent. 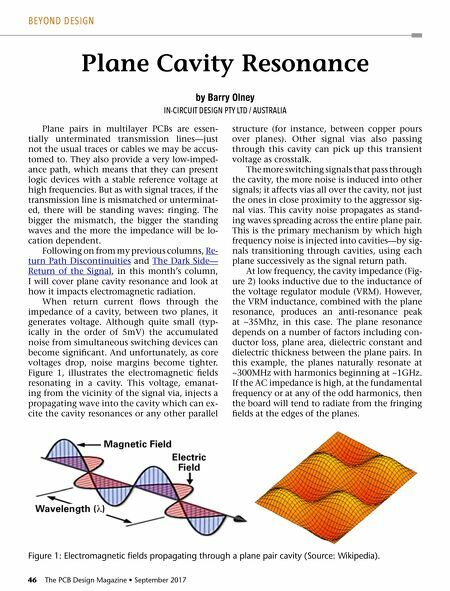 Following on from my previous columns, Re- turn Path Discontinuities and The Dark Side— Return of the Signal, in this month's column, I will cover plane cavity resonance and look at how it impacts electromagnetic radiation. When return current flows through the impedance of a cavity, between two planes, it generates voltage. Although quite small (typ- ically in the order of 5mV) the accumulated noise from simultaneous switching devices can become significant. And unfortunately, as core voltages drop, noise margins become tighter. Figure 1, illustrates the electromagnetic fields resonating in a cavity. This voltage, emanat- ing from the vicinity of the signal via, injects a propagating wave into the cavity which can ex- cite the cavity resonances or any other parallel structure (for instance, between copper pours over planes). Other signal vias also passing through this cavity can pick up this transient voltage as crosstalk. The more switching signals that pass through the cavity, the more noise is induced into other signals; it affects vias all over the cavity, not just the ones in close proximity to the aggressor sig- nal vias. This cavity noise propagates as stand- ing waves spreading across the entire plane pair. This is the primary mechanism by which high frequency noise is injected into cavities—by sig- nals transitioning through cavities, using each plane successively as the signal return path. At low frequency, the cavity impedance (Fig- ure 2) looks inductive due to the inductance of the voltage regulator module (VRM). However, the VRM inductance, combined with the plane resonance, produces an anti-resonance peak at ~35Mhz, in this case. The plane resonance depends on a number of factors including con- ductor loss, plane area, dielectric constant and dielectric thickness between the plane pairs. In this example, the planes naturally resonate at ~300MHz with harmonics beginning at ~1GHz. If the AC impedance is high, at the fundamental frequency or at any of the odd harmonics, then the board will tend to radiate from the fringing fields at the edges of the planes. by Barry Olney IN-CIRCUIT DESIGN PTY LTD / AUSTRALIA Plane Cavity Resonance BEYOND DESIGN Figure 1: Electromagnetic fields propagating through a plane pair cavity (Source: Wikipedia).